Wall Putty Powder Mixing Production Line is specially designed to mix and produce wall putty powder. It is mandatory mixing, and there is no dead angle in the working chamber, thus achieving uniform dispersion of various fibers and additives in the mortar. The equipment is easy to operate and easy to master. It is the best dry powder mortar mixing equipment selected by small and medium-sized thermal insulation building materials enterprises. Wall Putty Powder Mixing Machine is made of high quality steel plate, and its internal mixing system is a double fixed broken ribbon, fan-shaped mixing blade, and can be replaced. It is specially designed to mix and produce wall putty powder. It is mandatory mixing, and there is no dead angle in the working chamber, thus achieving uniform dispersion of various fibers and additives in the mortar. The equipment is easy to operate and easy to master. It is the best dry powder mortar mixing equipment selected by small and medium-sized thermal insulation building materials enterprises. Spiral feeding machine, single axis horizontal mixer (with a unique fiber dispersing device), spiral feeder, storage hopper, packing machine, dust collector (can be selected according to customer requirements) electrical control box, and so on. --- Less investment, less land occupation and higher output Capacity. --- Wall brushing plaster, etc. To add the material into the hopper of screw conveyor separately. 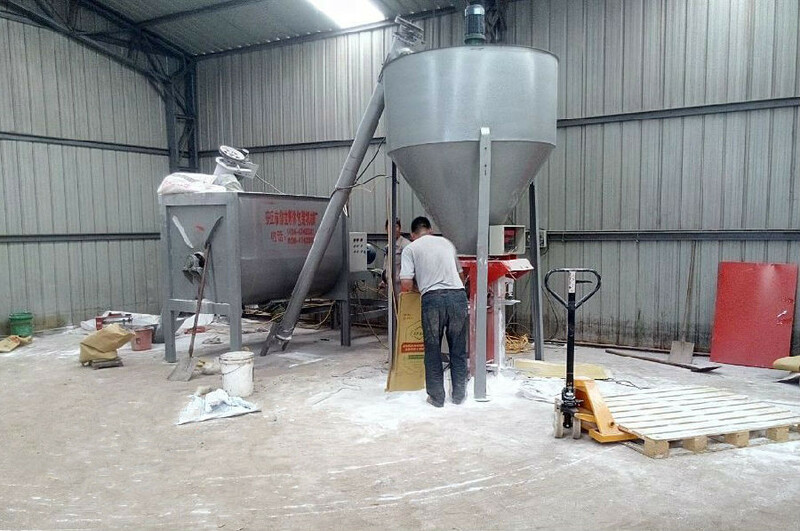 Firstly add cement, cellulose and other additive material into mixing machine through screw conveyor, then mix them for about 3 minutes, after that add the sand into the mixing machine, then together mix about 5 minutes. After that, through the outlet screw conveyor, takes out the dry mortar product, then sends it into Hopper. Through hopper the product dry mortar goes into powder packing machine, and to be packed into bags as need. --- Installation: determine the installation position of the mixer and then install the feeder, the discharging machine, the storage bin and the packing machine in turn. The power supply is 380V, 50HZ's three-phase alternating current, the control box is set up the total switch, the electric leakage protector is equipped, and the electric power line of the motor is used with the national standard cable. --- Before the use of the equipment need to add oil (planetary gear reducer to add oil), and then carry out unloaded operation, check whether the firmware is loose, electric is normal, machinery is running normal, such as abnormal. Repair and debug. --- Opening sequence: mixer - feed machine - feed machine - packing machine, feeding volume can not exceed the specified volume, when the feeding mixer can not stop, found abnormal in the way, must stop inspection immediately. --- Charging sequence: Cement (powder), additive (fiber), quartz sand (aggregate). --- Before working, the materials in the mixer or charging hopper must be discharged to prevent the material from hardening during the second day production and affect the normal production.